Who knew you could plant a garden in Red Deer in the middle of January? Well, Mrs. Grainger's grade one class did just that today, but it's a different kind of garden. The first graders planted a kindness garden. The idea to plant a kindness garden evolved after the kids were talking about 'No Name Calling Week' at Glendale School. We are joining thousands of others around the world to shed light on the issue of name calling by recognizing January 21-25 as No Name Calling Week. Mrs. Grainger's class was trying to think of a way to teach others kind words they could use instead of name calling. 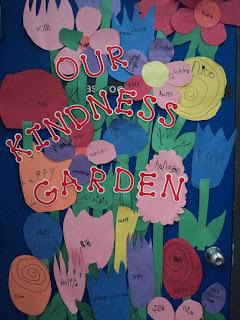 As they talked about what they wanted to do, they came up with the idea that everyone likes flower gardens, so why not create a garden that would teach others about kind words? They thought that people would see their garden and want to "stop to smell the flowers," and then they would see that the flowers weren't regular flowers. They would be good word flowers that not only looked and smelled nice, but sounded nice too! In honor ofNo Name Calling Week, January 21-25th.Grade 1G is sharing their put ups and put downs with you. Talking to the kids about their garden of kind words, and reading their tweets made my day today. We have to keep these conversations going. We have lots to learn from these kids.